Sorry to interrupt the cookie making, but we all need to eat dinner don’t we? I for one have been craving cozy, hearty dinners to balance the holiday confections, so this lasagna was so perfect last weekend. 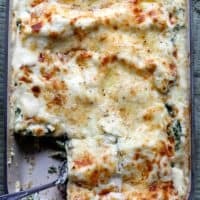 The spinach is sautéed with onions and garlic, mixed with a creamy ricotta mixture, and layered with the most decadent cheesy sauce filled with mozzarella and gruyere. I highly recommend getting the best cheeses you can, as the flavors really stand out and good cheese makes all the difference. Enjoy! In a large saucepan (I like using my big 5 qt dutch oven just to have a lot of room.) melt the 4 tablespoons of butter. Add the garlic and onions and sauté until golden. Add the spinach and stir for a few minutes to marry all the flavors. Turn off heat and set aside. To the food processor add the spinach/garlic mixture and pulse until finely chopped. Add to the bowl with the ricotta mixture as well as the rest of the ricotta cheese. Stir until blended and smooth. In a large saucepan (I like to wipe out the dutch oven a bit and use that again,) melt the 5 tablespoons of butter and then add the flour- whisking constantly until golden. Add the milk gradually, about a cup at a time, stirring well between each addition. When thick and bubbly, add 3/4 of the mozzarella and 3/4 of the gruyere. Add salt and pepper to taste. Cover tightly with foil, and bake at 400F for 20 minutes. Remove the foil and bake for another 20 minutes or until the cheese is golden and bubbly. This looks better than any cookie I’ve seen today! 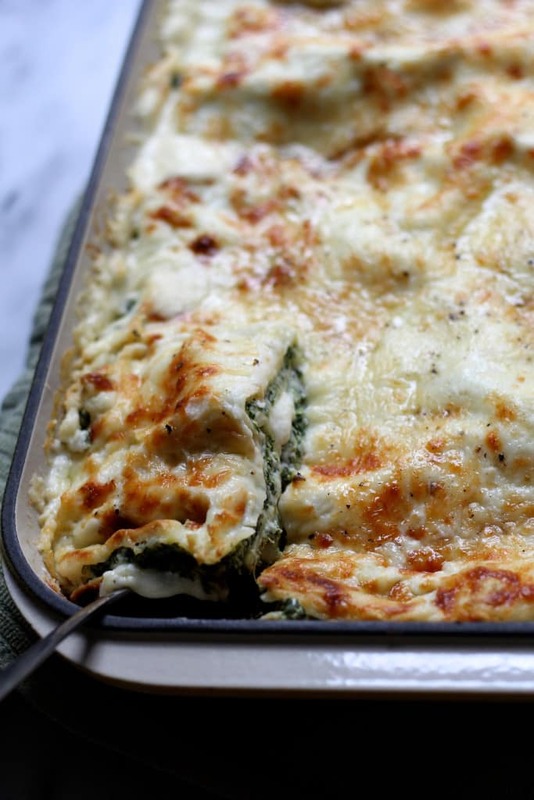 I’m seriously swooning over that gorgeous pan of lasagna, and I wish I had a big slice in from of me right now! Definitely going to have to try making this. mmmm mmm mmmm we def. 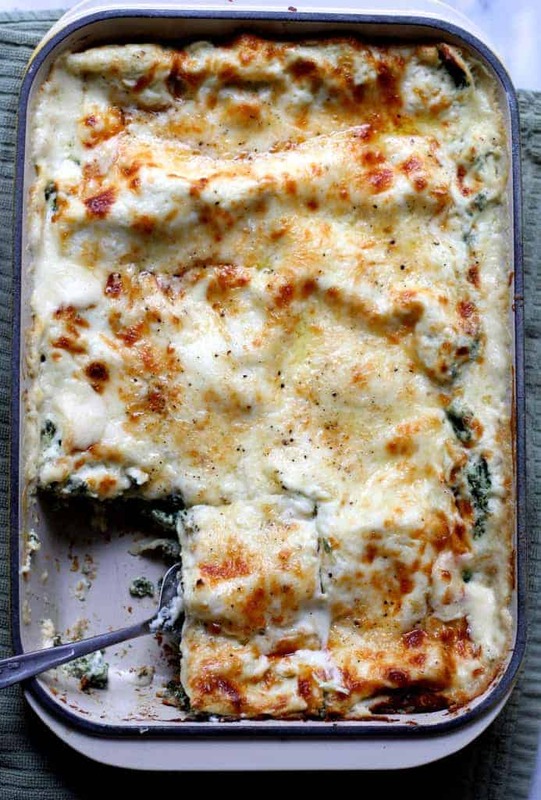 do need dinner and even I would be ok with taking a break from the cookies for some of this lasagna! Made this for dinner last night and it was wonderful! I love that the spinach mixture goes in the food processor. It makes a much more delicate sauce. This is the best spinach lasagna I’ve ever made. Thank you for this recipe. This is definitely a keeper! Hey Audra, here in Brazil I’ve never seen frozen spinach in the frozen vegetables section! Can I use fresh spinach? Thank you! Have a nice day! I just made it with fresh spinach and it worked out fine–I always keep frozen spinach in the freezer, but I had a ton of fresh leftover from another recipe and wanted to use it up before it went bad. I threw it in the food processor after the onion and garlic, then added it to the pan when I was towards the end of sauteing them. You probably don’t need to process it, but I didn’t want long stems interfering when I cut pieces of lasagna. I probably used 6-8 oz but could have used more. What is no bake lasagna noodles? I am anxious to make this but never heard of no bake noodles. They are noodles you don’t have to cook before assembling your lasagna! They’re awesome- you can get them at pretty much every grocery store! If I am planning to make ahead and freeze can I still use the no-bake noodles? When you say “no-bake”, I assume you mean “no-boil” and not some kind of fresh noodle? My daughter has celiac disease and I made this w gluten free noodles and gluten free AP flour and it came out wonderfully! I am a pastry chef and have been spending my free time adapting recipes to gluten free for my grown up daughter. I was very glad to see this recipe because she doesn’t like tomatoes!! Thank you!! Thanks for taking the time to comment- I’m so glad this recipe worked gluten free! Hi! I made this for the 2nd time this evening! I LOVE this recipe!!! Thank you!! The only comment I would have is that I had to cook it covered for 40 min’s and then cooked 30 min’s uncovered. This was in a non-stick pan and an electric oven. Thank you, my family loves it!! !